Maybe it’s me, but 1Kept sounds like the name of a boy band, which somehow makes sense, as something about the restaurant reminds me of one. Occupying the space previously filled by Barony Tavern in the Renaissance Hotel, it’s hip, yet polished. There’s black silverware and indie hits playing overhead. 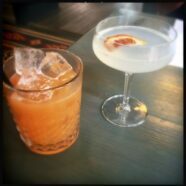 And on the bar are giant glass vessels in which they’re infusing alcohol with citrus and what looks like potpourri. Apparently they’ve applied the cold press method for coffee in what is notably an alchemy-meets-buzzword move. 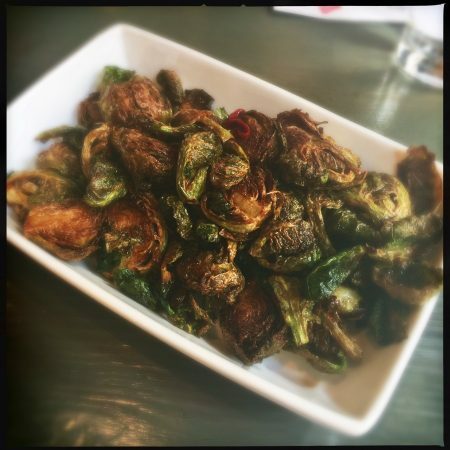 The crispy Brussels ($9) arrive deep-fried and in generous portion. Tossed with roasted red peppers and a sweet apple gastrique, this is exactly what you’d expect of the ubiquitous dish. It’s a vegetable rendered junk food, and why not? All the kids are doing it. Tasty and greasy, there are no surprises here. The black truffle popcorn ($6) seems to have been engineered to sell adult beverages. Holy salt lick, even when avoiding the thin shreds of grana padano cheese, it’s just too much. There’s probably truffle oil in there, whether it’s real or synthetic is impossible to tell at this salinity level. The tribute to the Cosmo ($10) is made with blood orange liqueur and white cranberry juice, but more or less tastes like a lemon drop. Maybe it’s psychosomatic, but it appears that without the red color, I simply cannot perceive cranberry. Go figure. 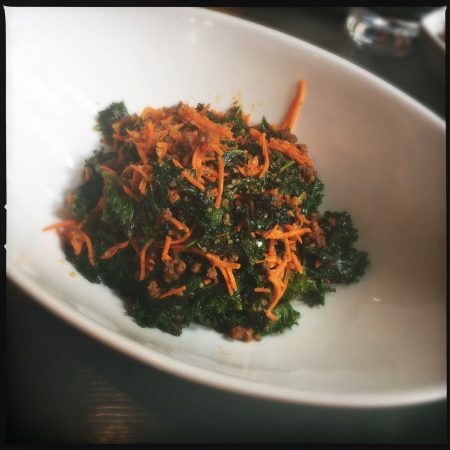 Kale and quinoa — our tired, modern day answer to ’80s quiche and tiramisu — both show up in the warm kale salad ($12) along with chorizo, shredded carrots, and chili oil. Although the menu mentioned golden raisins, they didn’t make it to my plate, which is too bad. 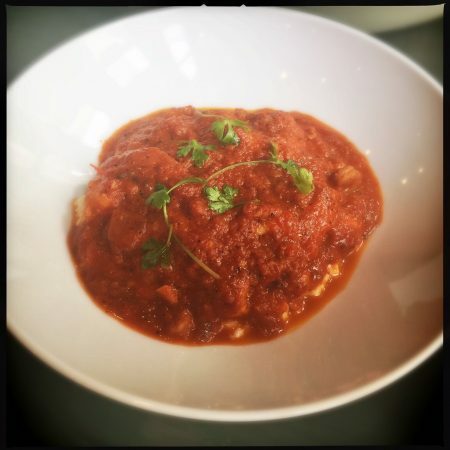 The dish is monotonously soft and mushy, yet dominated by vinegar and spice. Something sweet — and maybe a little crunch — wouldn’t hurt. The oil level is also a bit much, once again rendering a selection that is presumably healthy not all that healthy. 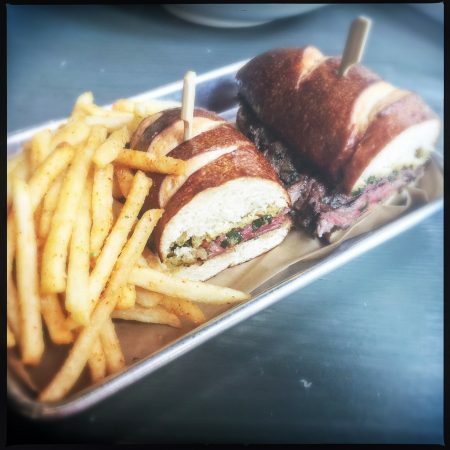 At lunch, the grilled skirt steak sandwich ($12) hits on many positive flavor notes, but is incredibly hard to eat. Served on a slightly-too-firm pretzel roll spread with chimichurri and horseradish aioli, the primary challenge involved biting through the skirt steak medallions. Shout out to your incisors: You’ll be ripping and tearing at this thing like a lion on a gazelle. The accompanying Togarashi fries were perfectly cooked, but way too salty. When you can visibly see the crystals of salt glistening on each thin potato sliver, you know you’re in for it. The friendly waitress informed me that the chicken schnitzel and herb spaetzle ($19) is considered the star of the original Atlanta location’s menu. The large, panko-breaded breast is crisply fried and covered in a homey, caramelized onion gravy. Accompanied by a very eggy spaetzle and tossed with a sauerkraut-esque braised red cabbage, it’s both comforting and authentic. I’m not really sure what this menu is about, but maybe there should be a few other German/Austrian items on it? On a similar note, maybe some more Italian influences too, as the shrimp and grits ($18 at lunch/$23 dinner) was the best thing I tried. Let’s level set: Where shrimp and grits are concerned, I am over it. Been there. Done that. Bought the Geechie Boy t-shirt. But this version is truly unique, with the creamy smoked pimento cheese grits emulating a risotto. Topped with a spicy red arrabbiata sauce and six plump shrimp coated in a briny crawfish butter, I didn’t see this one coming. But I’m glad it did. Yes, 1Kept may be the Backstreet Boys of restaurants, but considering its hotel location and “aiming to please” menu, odds are you’ll want it that way.